Until recently, I was becoming a conference skeptic. Hours of poorly structured panels, questions that weren’t questions, and mediocre coffee do not make for inspiring conversations or terrific takeaways. But this changed recently. 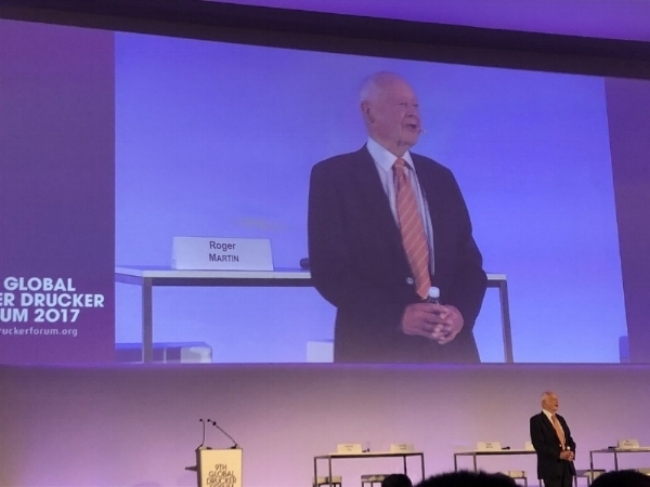 After my essay was shortlisted for the Drucker Challenge, I was invited to attend this year’s Global Peter Drucker Forum, held in Vienna each November. It inspired me, and I wanted to share some lessons from the Forum about how to think about leadership in organisations. Here are three of my favourites. Hal Gregerson, an authority on leading innovation, asked this question to an audience full of leaders: then told us that if our last uncomfortable question wasn’t recent, we were doing something wrong. Some leaders surround themselves with staff who make the leaders’ life easier but, in turn, make that leader more isolated and less effective. He added that we should also ensure we are regularly in positions where we are quiet (listening to others instead of giving our views) and wrong (corrected by people who are comfortable doing so). The entreaty to ask leaders to be regularly uncomfortable, quiet, and wrong is a reminder that one of the most important traits a leader needs is courage. While plenty of leaders are happy being quiet, few enjoy being uncomfortable or wrong. This means not only accepting correction or questioning, but actively seeking it out, wading through awkwardness on both sides, taking criticism and using it to get better. I’ve been trying out questions with my team to make this easier for them: “what should I do differently next week?”, “what is the company doing that worries you?”, “do you have any feedback for us?”. A strong theme throughout the conference was the role of technology in our lives and our organisations, and in particular, its excesses. This was a concern across disciplines: leadership and management, social anthropology and economic history. Speakers including Julia Kirby, Rahaf Farhoush, Don Tapscott and Carlota Perez each spoke on this theme. They warned that technology has not given us the promised connectedness but, instead, has increased isolation and exploitation. I think Charles Handy summed it up best in his final address when he talked about his own humanity and said that, at his best, he has hopes and dreams and imagination: “the things that make me interesting cannot be digitised”. The Saturday after the conference, the New York Times published a piece with a similar theme: David Sax writing “Our Love Affair With Digital Is Over”. It’s a compelling headline, but I don’t think it’s quite as simple as that. Some of our hopes for digital are disappointed, but we continue to live huge parts of our work and social and creative lives online and, increasingly, on smartphones. The question for leaders is how to reconcile technology as it is with human desires for connection and for belonging. Some tools are better than this at others; and no technology will ever be as good as making time for face-to-face. I increasingly think that the best thing technology can offer us is more face-to-face time: rescuing us from drudgery, from administration, and from the least creative work. To me, this is about seeing new technologies such as artificial intelligence as similar to the dishwasher or the vacuum cleaner, saving time for things that are more precious. If this is right, it means that individuals and organisations have a big responsibility to find ways to make sure that any time freed up is used well (and not just on our smartphones). This was a quote was from Chris Maclay, Head of Growth at Lynk Kenya, inspired by the idea that businesses exist to solve a problem for people. Chris was a prize-winning essay writer attending as part of the Drucker Challenge (the competition that also brought me to Vienna), and his company helps workers in Kenya to find jobs more easily. This was a theme echoed by Ali Rushdan Tariq, a Drucker Challenge winner, who argued in his essay that the best source of competitive advantage for a modern company is compassion - for its employees, its community and its society. Tammy Erickson commented that organisations should be very clear on what they offer employees, then meet those expectations. The expectations should be simple: for Exxon Mobil, for example, it is being ‘safe and ethical’. Compassionate organisations can show their values in a variety of ways: by paying their employees properly (avoiding unfair practices like unpaid internships), by helping their teams work on projects they feel passionate about, and for showing they care about employees as people at times when they need extra support. For us at Oxford Insights, the decision to pay ourselves last (and, to begin with, less than our interns) was about helping to form and then live up to compassionate values. At a time when machines are getting better at many of the things humans do well, a compassionate organisation reminds us of the things humans do best.